Not content to merely order a re-pressing of the same masters on hand at the cd manufacturer, Taylor Deupree set out to create what he calls the “director’s cut” of one of the most important cds in his catalog. The idea was to open the now-2-year-old computer files to re-mix and re-master the tracks. Of course over the course of years computers change, formats change, and Deupree found himself faced with missing plug-ins, errored sound files and other oddities that made working with the files difficult. What first seemed like roadblocks turned into a mission to work with what was there and re-do what was not. The result is a Northern that will, on the surface, seem quite similar to the original, however listeners will hear new sounds, extended endings, shortened endings and most of all, an overall mix that presents these works with a new clarity and spaciousness. Mastering in the analog domain has given the work a new found sense of delicacy and detail. A heavyweight cardboard wallet with debossed typography on the front cover. Inside are two pockets, one for the CD and one for a 24-page booklet of photography, credits, and lots of white space. All printing, as with the original, is in black and white. The inspiration behind Northern (including its music, title and photography) comes from Deupree’s recent relocation from the heart of urban activity in Brooklyn to the tranquility of the forest in upstate New York. Inspired by nature and the winter during which it was created, Northern, like much of his recent work, explores Deupree’s interest in stillness and a slowed sense of time. Through quiet textures, subtle movements, faint loops and echoes, it was his goal to create the type of music that comes naturally to him while also highlighting the input from his dramatic new surroundings. In contrast to the brazen repetition found on Stil., Northern more ephemeral approach to Deupree’s theme comes from looking at the stillness found outside of his studio windows: large, looming boulders, the softness of snow, and the hushed whisper of wind and fallen leaves; it is a world of countless tiny movements so active that an implied stillness results from the din it creates. Deupree’s earthbound ideas in the album are rooted in his choice of sounds and studio practices. His now-signature Kyma manipulations are still prominent, but they have been applied to improvised electric piano, melodica, guitar, and field recordings using techniques picked up from his experimental/pop collaboration with Eisi (Every Still Day, Noble Records, Japan, 2005). A careful balance is kept through the layering of synthetic source tones of basic waveforms and long, drawn-out, fragile swells. Northern is melodic, warm and introspective, forming a bed of sound that is simultaneously quiet and noisy, structured and unsettled, looping and chaotic. Deupree has dedicated Northern to his closest friend of his teenage years, Bryan Charles Strniste, with whom he first started experimenting in electronic music over 20 years ago. Deupree’s relocation to a nearby area much like the one where he grew up spurred memories of those days of early musical playfulness. Thus, Northern became highly personal and nostalgic while at the same time breaking into new territory for Deupree, echoing the changes in his personal life. 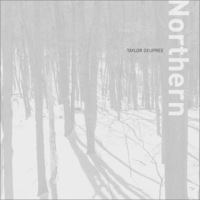 Northern is the first solo CD from Taylor Deupree since 2004’s January (Spekk, Japan), and the first on 12k since the seminal Stil. (12k, 2002).